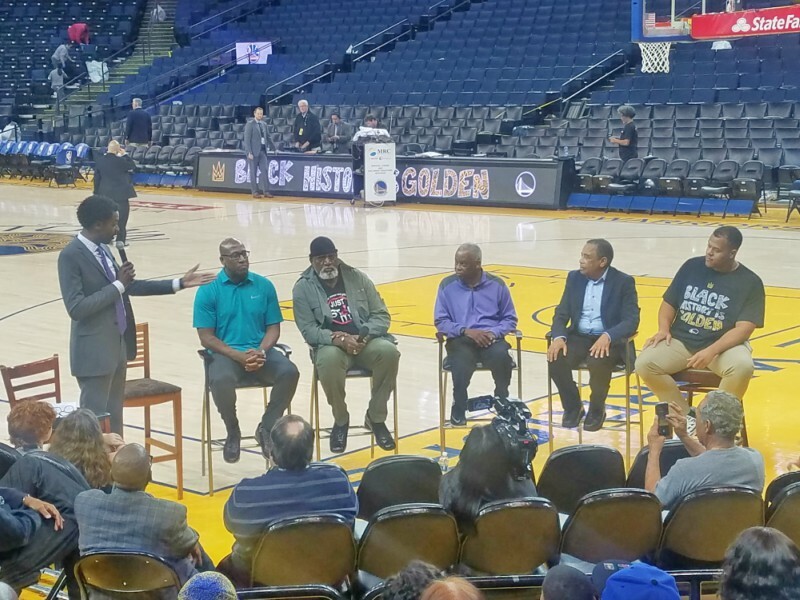 Warriors host Black History Month is Golden postgame panel discussion on the court with event moderator KNBR radio personality Rod Brooks and panelists; two-time Olympic gold medalist and WNBA legend Ruthie Bolton, Warriors Assistant Coach, Mike Brown, San Jose City College Men’s Basketball Head Coach, Percy Carr, UC Berkeley Professor, Dr. Harry Edwards, Former Mayor of Oakland, Elihu Harris and San Francisco 49ers Guard, Joshua Garnett. Bolton played in the Women’s National Basketball Association (WNBA) with the Sacramento Monarchs. Currently, she is the head coach for women’s basketball at Vacaville Christian High School in Vacaville, sings gospel and participates in the SportsUnited Sports Envoy program for the u.s. Department of State conducting basketball clinics for youth and women worldwide. “I grew up in a household where are my parents tolerated no excuses,” she said. Edwards worked with Martin Luther King, Jr., Malcolm X and joined the Black Panther Party with Huey P. Newton. As Professor Emeritus of Sociology at UC Berkeley with a PhD from Cornell University, Edwards has served as a consultant to the San Francisco 49ers and the Golden State Warriors. The Author of The Revolt of the Black Athlete, was the architect of the Olympic Project for Human Rights, which led to the Black Power Salute protest by African-American San Jose State University athletes Tommy Smith and John Carlos at the 1968 Summer Olympics in Mexico City. “Black history is American history it’s all of us together,” said Edwards. Coach Percy Carr credited a mentor that helped him develop as a coach at San Jose State University. Carr earned his 900th career victory during a recent 72-63 triumph at Hartnell College in Salinas, California. At 73, Carr has the most wins of all time among black men’s coaches in college basketball history. Elihu Harris, the 46th mayor of Oakland served the California State Assembly and was also Chancellor of Peralta Community College. Harris received a Master of Public Policy from UC Berkeley and a law degree from UC Davis School of Law. “We were from a family of educators in Arkansas and my grandpa graduated from college in 1908,” said Harris. San Francisco 49ers Football Guard Joshua Garnett said his father explained the vulnerabilities of being an athlete and encouraged him to strengthen his mind. The Stanford University graduate is also the son of Scott Garnett, who also played for the 49ers. “This is a time to both celebrate our heritage and educate people on our culture,” said Garnett.